Star Fire was a groundbreaking shoot 'em up arcade game that brought a number of new innovations to the market; including being the first to use a sit-down cockpit. The look and feel of Star Fire was inspired by the original Star Wars film and, to a lesser extent, the TV show Battlestar Galactica. The attract-mode screen displays the name "Star Fire" in a swooping sans-serif typeface similar to the Star Wars logo. The primary enemies in the game are spaceships that are virtually indistinguishable from TIE fighters. The player's primary weapon is an array of 4 lasers that fire in an "X" pattern, implying that the player is flying a ship configured similarly to an X-Wing. Notwithstanding these similarities, Star Fire was not officially licensed to use the Star Wars trademarks. 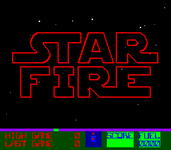 Star Fire's on-screen graphics are brightly colored blues, greens, and reds. This was an unusual feature in 1979 and the graphics made it stand out from many other arcade games of the era. The player controls whether his ship is moving forward or backwards via a Thrust Control lever and a Steering Yoke is used to control the player's ship. The controls are loose and somewhat floaty; nimble moves are not possible. The player has a button that fires his Laser Beam at the center of the screen. The lasers travel slowly, taking about 2 seconds to reach their target, and only one "shot" can be on screen at once. Furthermore, each shot the player fires causes heat to build up in his ship. If the player's rate of fire is too high, his guns will overheat and he will need to wait for them to cool down. If the player can maneuver such that an enemy TIE fighter-like ship is directly in the crosshair gunsight, the targeting computer will "lock on" and any shots fired will automatically hit. When the player successfully shoots an enemy fighter, the screen prints "GOT HIM". Occasionally, a thinner, horizontally oriented ship that looks like a Viper from Battlestar Galactica will be seen. These have "Exidy" written on their tails, and are worth the largest amount of points. If the player successfully shoots this ship, the screen displays "GOT US". These ships cannot be locked onto. The game is timed. The more quarters the player puts in, the longer he can play. As the player shoots enemy ships, they increase in point value, and also in elusiveness. If the player reaches certain point thresholds, he is given more "fuel" and can thus play longer. The player's ship can be shot by the enemies; this simply resets the quality of enemies (and thus their point value) down to the lowest level. Star Fire was the first arcade game to allow a player to enter his or her initials in to the high score table (the current high score record is 9,780 points, set by Laura Curran of Las Vegas in January 1982). Star Fire was also one of the first games to allow the player to partially damage an enemy with a glancing shot. Star Fire can be run (emulated) on a PC by the Multiple Arcade Machine Emulator. It is one of the few games that has legally released for use on the MAME emulator, along with its unreleased update, Star Fire II. Source: Wikipedia, "Star Fire", available under the CC-BY-SA License, supplemented by information from Exidy's Star Fire Operator's Manual.